BEAUTY ARTISTICA: All you need this CAPSULE to solve your SKIN problems - No more SPOTS, MARKS or WRINKLES! All you need this CAPSULE to solve your SKIN problems - No more SPOTS, MARKS or WRINKLES! This magical capsule is called Vitamin E. The oil inside this capsule has antioxidant properties and used in many skin care products. It helps to heal sun damaging skin, age spots and wrinkles. It also improves your skin tone and texture. In this post I am showing you how to use this vitamin E oil for skin problems? Here’s your guide. Take one tbsp of yogurt and add one vitamin E capsule’s oil in it. Mix it and apply on your suntanned skin for 15 minutes and then wash it off with lukewarm water. Follow this 2 or 3 times in a week to get fair skin. Take one vitamin E capsule and squeeze the juice from it. Apply this oil directly on your wrinkles and aging lines. Follow this method every night before sleep, and leave it for all overnight. Your wrinkles will be gone within a week. Apply vitamin E oil directly on your chapped lips. Alternatively you can add vitamin E oil into your lip balm then apply on your chapped lips for more effective result. 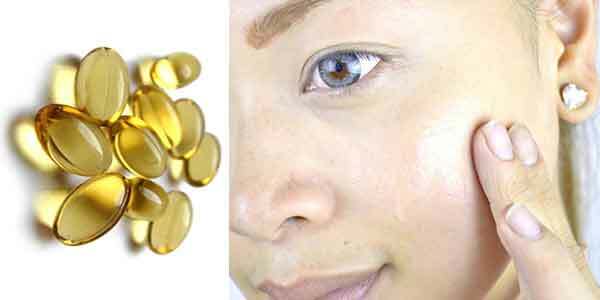 Vitamin E oil has antioxidant properties so it helps to treating acne and ugly pimple marks. You just apply vitamin E oil on your acne or scars and leave it for all night.